Episode 33: "The Man with a Hundred Faces"
Pietro Monti, a stage performer billed as "The Man of a Hundred Faces," performs before a nightclub audience which includes Charlie Chan and his son, Barry, as well as Inspector Rietti of the Venice Police. A skeptical Barry Chan comments how Monti’s disguises could never fool him, only to fail to recognize him as the flower lady who offers his father a bouquet! Later, back at their hotel room, Chan informs Barry that he also failed to observe a note that was included in the bouquet requesting Chan's assistance. Chan, pondering the prospect of finding a man of a hundred faces, suggests that they allow Monti to find them. The next day, Chan and Barry take a gondola ride through the canals of Venice. 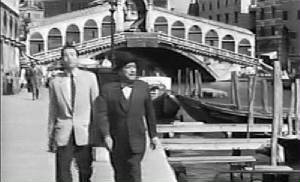 Barry, amazed to discover that their gondolier is none other than Monti, is informed by Chan that it had been arranged with Monti to take a gondola at the Rialto Bridge at a specific time that morning. Monti then tells Chan of the reason for needing his help. A year before, Monti’s brother, Vittorio, got into trouble while passing bad checks. Monti was able to hide his brother from the law, but, recently a man named Vicente Donati revealed his knowledge of Vittorio's crimes and threatened to expose the truth unless Monti, using his abilities at disguise, would help him pull off a series of robberies for Donati who is the head of a large gang. Monti asks that Chan tell Inspector Rietti about his situation and also that he would be willing to help the authorities round up Donati's gang in exchange for leniency for himself and his brother. Chan agrees to do what he can to help. 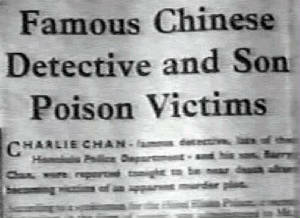 Later, seeking information on Vincente Donati, Chan and Barry visit Inspector Rietti. Handed a file by Rietti's police clerk, Romano, the detective learns that Rietti’s only documented crimes, committed years before, were of a very petty nature. Before leaving, Chan asks for a list of all unsolved large-scale robberies. Chan Barry pay a visit to Donati's import/export business which is a front for his criminal activities. Chan tells Donati that, despite his extensive world travels, he would like to settle for a while in Venice and wishes to invest $15,000 in Donati’s business. As Chan leaves, Barry, who was stationed outside, tells his father that he saw a familiar looking man slip into Donati's business through a side entrance. Upon description, Chan believes he recalls seeing the same man earlier. Inside his business, Donati meets with this same man who is Rietti’s police clerk. 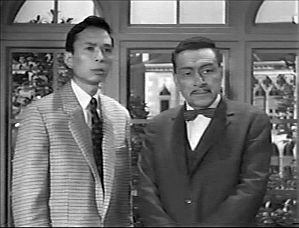 Donati tells him that "since he chooses to stick his nose into our affairs, time for retired Inspector Charlie Chan is running out…fast." In their hotel room, awaiting room service delivery of their lunch, Barry, showing Chan his growing detective skills, shares his thoughts on how Donati's gang, having a network of contacts, will probably be gunning for them. As Chan concurs, room service arrives with their lunch, stating that they need not worry about being in danger from Donati's gang as the room service waiter turns out to be none other than Pietro Monti in another disguise. He informs the detective that another crime, an art heist, is planned for the next day at the as a valuable painting is delivered from the Academy Museum to the palace of Count Vinci. Monti informs Chan that he will be disguised as the director of the Academy. Interrupted by the arrival of an assistant waiter, Monti, presenting one of the dishes, notes to Chan that "the chef had MUCH to prepare." Alone, a famished Barry reaches for a bite to eat. Chan halts him, grabbing the food away as the phone rings. It is Donati. Chan, speaking about his business proposal, suddenly speaks of pain in his stomach and collapses. Barry picks up the phone, telling Donati that something is wrong with his father. After Barry hangs up, Chan suddenly "recovers," informing Barry that Donati had tried to poison them. Chan then phones Inspector Rietti requesting a meeting that night adding that there will be a spectacular headline in the evening paper. That night, Chan with Barry and Inspector Rietti reads the account of his own demise, as they discuss the events the next morning. The next morning, as Chan, Barry, and Rietti observe from a window across the canal, they see the boat, with Monti aboard posing as the museum director, making the delivery of the painting to the palace of the count. They observe the delivery of the painting to the count as Monti follows him into the palace. As the boat leaves, Chan informs Rietti that he has asked the police to halt it further down the canal, adding that he will explain that move later. Inside the palace, after the paint has been rehung in its spot, Monti, following the plan, pulls a gun on the count. Next, a boat arrives carrying Donati and gang members to the door of the count's palace which they enter in order to steal the painting. At this point, Chan notes that the police will now be going into action as the three leave to cross the bridge to the palace. Inside the palace, Donati and the gang members are in police custody. Rietti announces that the gang is captured and the painting has been safely returned, and the case is now closed. However, Chan asks that the count and the museum director be brought into the room as he declares that the painting that has been delivered is a fake. Chan states that Monti, who switched the painting, is the true leader of the gang and that he had double-crossed Donati, wanting make this final crime a big one for himself. After an officer arrives with the news that Monti has escaped, the count enters and tells how the missing Monti had pulled a gun on him and locked him in his study as he had intended to steal his painting. Chan informs the count that his painting has indeed been stolen, but that it is safe, still aboard the boat that had delivered the fake painting. The count suddenly appears to suffer a problem with his heart, telling Chan that he must go and see his doctor after which he will go to police headquarters. However, Chan tells the count that he will be going to police headquarters now, with Chan's announcement that the count is actually Monti in disguise. Suddenly, Monti pulls a gun on Chan and forces him to leave the palace with him. As they pass through the room, Donati punches Monti, saving Chan. As the police round everyone up, Chan notes that they will find the real count still bound downstairs. Charlie Chan (to Barry Chan): "You see, Barry, this morning I received word to be near the Rialto Bridge and meet gondola at 10:45." Rialto Bridge - The Rialto Bridge crosses the Grand canal of Venice. This famous stone bridge consists a single span and was designed by Antonio da Ponte and was completed in 1591. Two inclined ramps lead up to a central portico. On either side of the portico, the covered ramps feature rows of shops. Vincente Donati (to Charlie Chan): "My secretary tells me that you are the famous detective from Honolulu." Pietro Monti (to Charlie Chan): "The count had lent one of his finest paintings…to the Academy." Venice Academy - The Gallerie dell'Accademia is a museum gallery of pre-19th-century art in Venice. 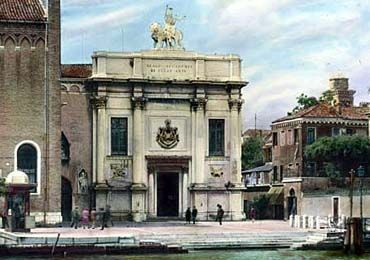 It is housed in the Scuola della Carità on the Grand Canal. Opening in 1750, it was originally the gallery of the Accademia di Belle Arti di Venezia, the art academy of Venice, from which it became independent in 1879. The police are always appreciative of help. When dealing with fronts, sometimes necessary to put front on oneself. Must always remember old saying: "Man who sees dawn sees beauty, but man who sees sunset survives the day." 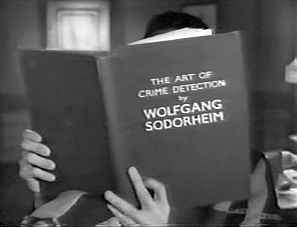 In Wolgang Soderheim's book it says, "Keen observer is never fooled."